Walk down the aisle at the Country Inn & Suites and start the rest of your life together in style. 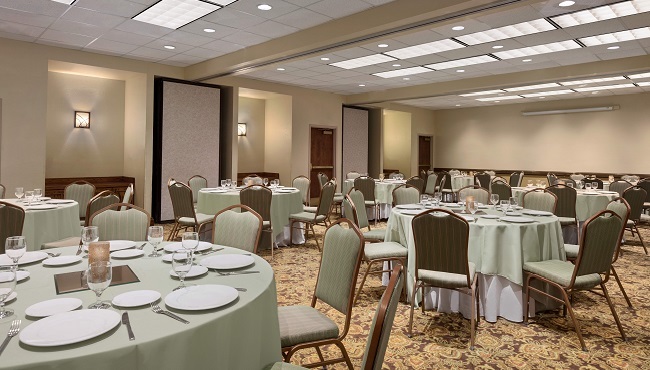 In addition to our gorgeous Grand Salon, we offer smaller event venues that are perfect for an engagement party, bridal shower, rehearsal dinner or newlywed brunch. When you book your wedding with us, your guests gain exclusive access to our recessed lobby area, featuring rich wood paneling, fashionable furnishings, a fireplace and a full-service bar. After your attendees mingle in the lobby, gather in the Grand Salon to officially tie the knot. Our staff can also provide a dance floor for endless entertainment after the ceremony. If your wedding party plans to celebrate late into the night, be sure to book a block of guest rooms in advance. Ready to get started? Contact our event planners today for personalized, one-on-one assistance so your wedding runs as smoothly as possible. Upon request, our staff is happy to create a free private Web page with the details of your event. You can use this page to communicate information to your guests and to allow them to make their room reservations at the special wedding rate.